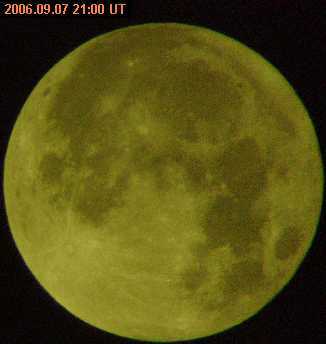 07 September 2006. Partial lunar eclipse. Russia, Novosibirsk. 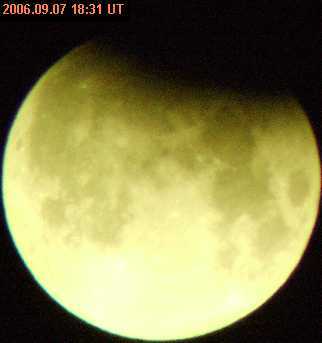 The partial lunar eclipse on 7 September 2006. 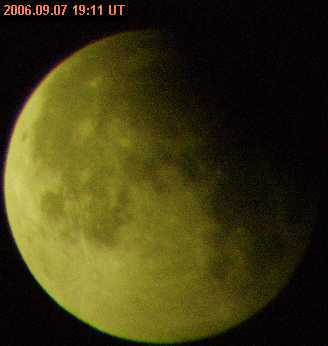 Even several days before the eclipse Novosibirsk found itself in huge anticyclone, that provided a long periond of virtually cloudless weather. In local time the first penumbral phase was to begin just ahead of midnight (23:42:19 l.t. ), so I didn't came to bed before the eclipse. Visibility of this eclipse was very favorable for Novosibirsk. 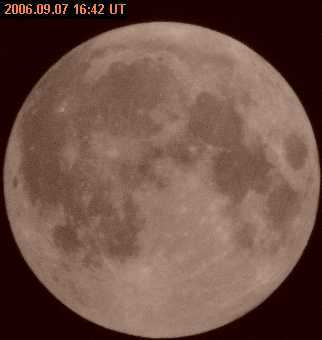 The Moon culminated on very comfortable altitude of 27В° not long before the moment of maximum, this gave a very good sight during all the eclipse. 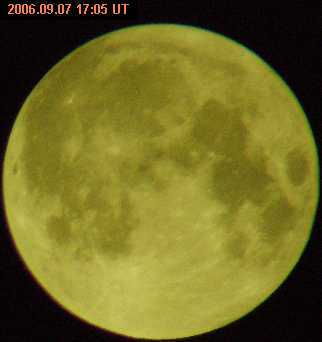 I periodically make shots with my digital photo camera, the first signs of darkening appeared on the Moon disk nearly a half on hour after the penumbral phase began. Closer to the first partial phase moonlight in my backyard had significantly weakened, with notable improvement in stars visibility. 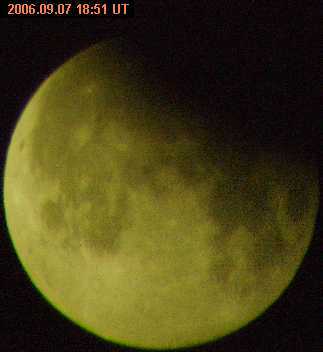 Finally the Moon began entering in the Earth's umbra. 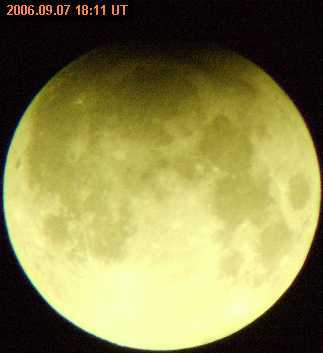 It should be noted, that taking shots of partial phase of a lunar eclipse I was less successfull than before because of great difference in brightness of various parts of the lunar disk. 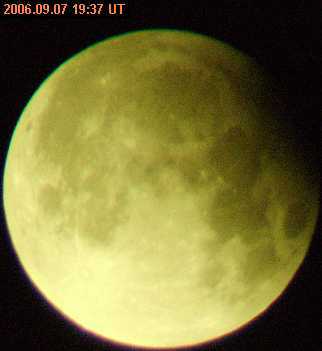 Looking at the Moon through binoculars when it was maximum phase and its north-western limb was in the umbra, I saw this darkened piece of the Moon very good and it seemed to me that it had some reddish colour. Perhaps, the Earth umbra this time was quite "light". The illumination level in my backyard was appr. corresponding to the not eclipsed Moon in phase ~0.2-0.3, I could see the stars nealy 1 mag fainter then before the eclipse. After the maximum events went in backward direction. 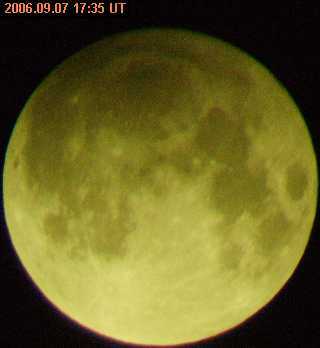 Umbra, and later penumbra, was gradually moving to the western limb of the Moon, the sky and ground againg began gelling more lit and a half an hour before the end of last penumbral phase everithing became as usual diring the full Moon - the sky and backyard lit with bright moonlight. The next eclipse in Novosibirsk will be the full lunar eclipse on 4 March 2007. It will be visibly almost completely except of the last penumbral phase.